Swedish Christmas Candy – Knäck! This weekend, the boyfriend and me made Knäck! That sounds wrong. Let’s try again. This weekend, the boyfriend and me made traditional Swedish Christmas caramels! I feel so Swedish now! 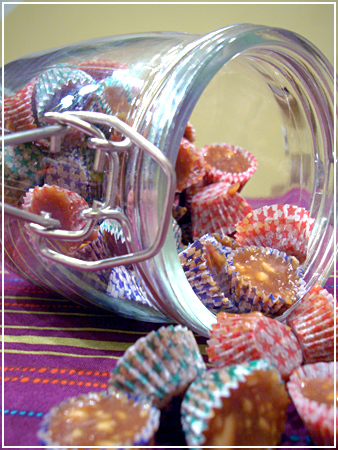 And it wasn’t even hard – surprising for anything that contains the words “caramel” and “candy”, Knäck is amazingly easy to prepare. 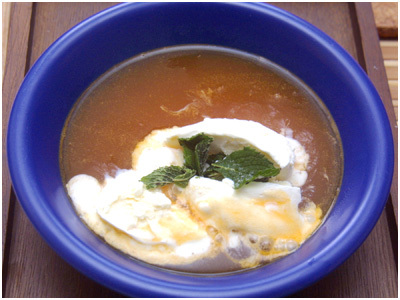 Knäck is a kind of Toffee, made with sugar, syrup, butter, cream and almonds. The consistency varies depending on local tastes, from fudge-y to stick-to-your-teeth hard. The longer you boil the candy, the harder it will become after pouring. Ideally, you should be able to stack them in a jar without them sticking together. The candy comes in little paper cups that look like muffin cups but are thimble-sized! 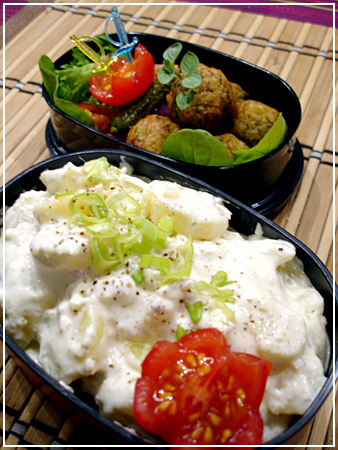 They are sold all over in Sweden during Christmas time and usually, the back of the packet contains the recipe. 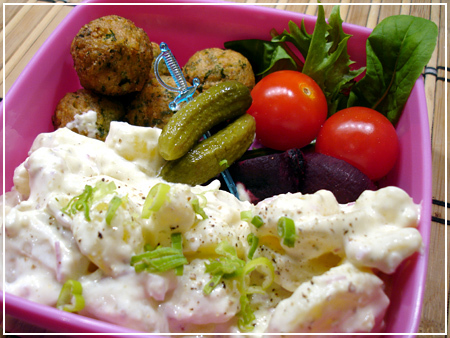 Since we doubled it for our purposes, this recipe makes about two jars of Knäck. That is quite a lot! 150g sweet almonds, peeled and chopped. Lots of those tiny little paper cups. We made about 120 with this recipe, which is half a packet. Dump everything but the nuts together in a thick-bottomed pot. Boil for approx. 30 minutes. When it reduces and becomes a darker shade, try dripping a spoon or so into a glass of cold water. 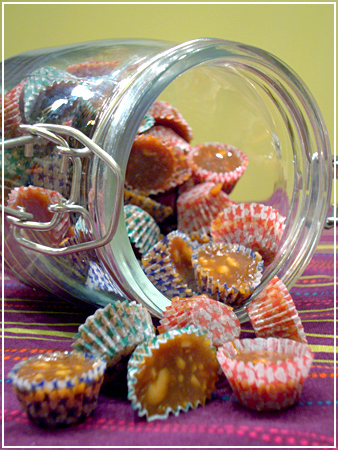 If you can easily mold the caramel after fishing it out, without it crumbling apart, it’s done. During the time it boils, prepare a lot of those small paper cups, best on a baking tray so that you can move them close to the pot for pouring. You should have them all set up and ready to be filled or you won’t manage! Mix in the nuts and put a spoonful into each paper cup. 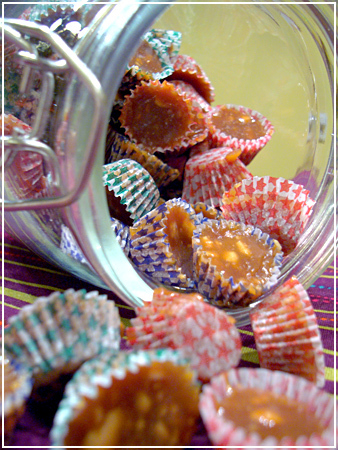 Be careful to keep the pot over low heat in the meanwhile so the candy doesn’t harden in the bowl. Let cool at room temperature, then store. I had brought out my pretty Christmas-themed candy boxes, but the boyfriend said they looked best in glass jars. And here they are, the saffron cakes! They are actually yellow, much more so than normal cakes. The smell of saffron is now an integral part of my christmas… mmm! 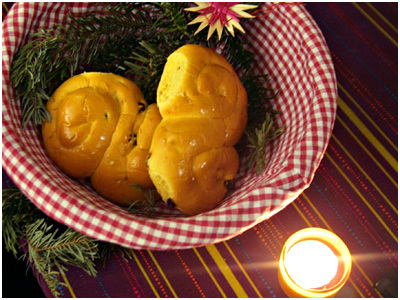 Now that I’ve written so much about Austria, I should write something about Swedish christmas traditions too. Today in the morning, I tiptoed into my work’s garage, where in the dark, surrounded by test cars, prototype engines and various tools my colleagues sat at tables by candlelight, drinking mulled wine on work time. St. Lucia is a wonderful Swedish christmas tradition – that is, if you unlike me have no problems with getting up early and can actually enjoy music then. 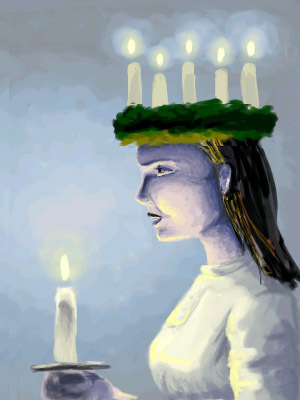 On Dec 13, before it gets light, St. Lucia walks the rooms of Sweden waering a white dress and a wreath of lit candles in her hair. Traditionally, it is the youngest daughter of the house who is Lucia, accompanied by the rest of the children in similar robes. They carry candles, sing christmas songs and bring breakfast – coffee, mulled wine and the traditional yellow, spiraled-S shaped saffron buns – to their parents. At offices and schools the tradition is also kept. It is very beautiful, and many places put much pride in their choir singing. The picture above is an unfinished sketch I made from my impression of seeing it at university the first year I spent in Sweden – girls singing by candle light in absolute serenity. Mmm… winter and darkness are so much more bearable with such traditions! Oct 4 – Kanelbullens dag! October 4th is Kanelbullens (Cinnamon rolls) day in Sweden! 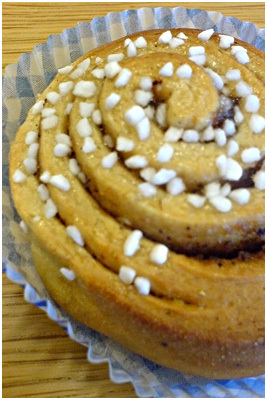 But I am planning to make some in my new food processor soon, and post a recipe for “real Swedish” cinnamon rolls!